Geniusity lies in simplicity, making one think: ‘Oh, I could have done that!’ but then, someone actually did it, much before anyone thought of it, especially if the ideas have been there..for a long time, that is the ARMANI magic! Set against a huge screen showing desert vastness of mystical arabian’s empty quarters, audience was treated by Armani’s exotic journey entitled ” La Femme Bleaue”…literally! 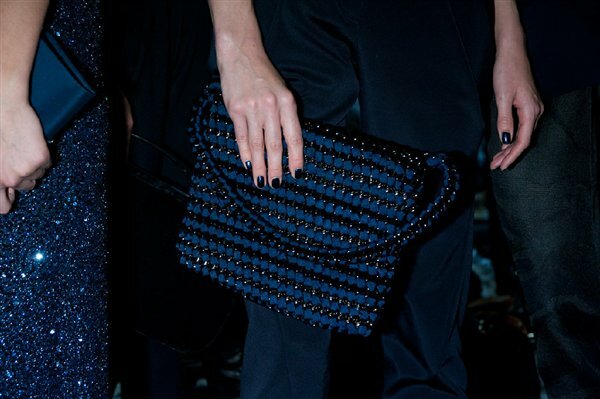 Giorgio Armani presented black and dark navy blue collection in Milan Fashion Week’s show- ender. Known for his minimalist silhouette, Armani played supremacy in Milan’s pret-a- porter business. Organza frills and crystalized brooches and clutch bags with beadworks fused the sartorial images of an Armani women. The turbans with cropped jackets in slim engineered trousers, those dresses in asymmetrical cuts belong to women who loves glamour, red carpets and elegant soirees. Armani’s signature pieces: tunic tops with leather blazers, bows, layering chiffons in high quality finish. Forget the mayhem surrounding Milan Fashion Week this season. It’s still the intricacy of an exquisitely made simple pieces by seasoned maestros, who superbly cut above the rest.